This is not really a recipe.It’s much more about making informed seafood choices, as you will see. Toast bread slices, spread with butter, pile on the smoked salmon on the side for Leandro. 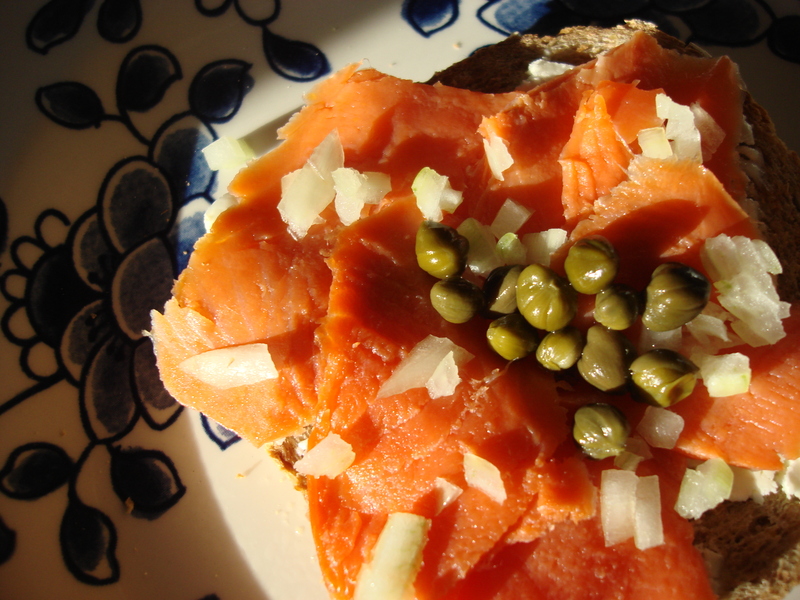 Toast less bread, spread with butter, pile on the smoked salmon, a half teaspoon of finely chopped onion, and a half teaspoon of drained capers (drain well, as the caper juice will overpower the salmon) for me. You could also dollop on the sour cream or dab a bit of cream cheese. What this really is is a chance to talk about selecting salmon. Salmon is good for you because of those famous Omega-3 fatty acids. The Mayo Clinic (one of my favorite sources for reasonable medical information; very calming in hypochondriac or worried mom moments) talks about the benefits of eating fatty saltwater fish, especially salmon, in this article on Omega-3 in Fish. My salmon on toast. Beats the hell out of bagel with lox, I say! I am including a link to an article on why not to eat salmon by PETA (People for the Ethical Treatment of Animals), but have to say, as someone who is not a vegetarian, ethical or otherwise, I found that the article simply convinced me that Wild Alaskan Salmon is the way to go, as farm-raised salmon sounds like it doesn’t eat or live the way I want my future dinner to. And when it comes to taste and texture, again, Wild Alaskan wins hands-down. It is also a sustainable fishery, as far as I can tell. Feel free to point out any information sources that contradict this. There is a lot of confusing literature out there. Fresh or Frozen from The Daily Green – well you can read it and get more of a sense of the complicatedness of the matter, or read it and say, huh? Monterey Bay Aquarium Seafood Watch – printable wallet-sized responsbile fish buying guide. And a final note: lox is different from smoked salmon in that lox is cured. It is part of the True New Yorker Test to know that. Not being Jewish is not an excuse. Neither is not reading to the end of my blog post! Wild Irish salmon is the way to go over here. I have ordered mine already for Christmas. There are so many misleading descriptions. 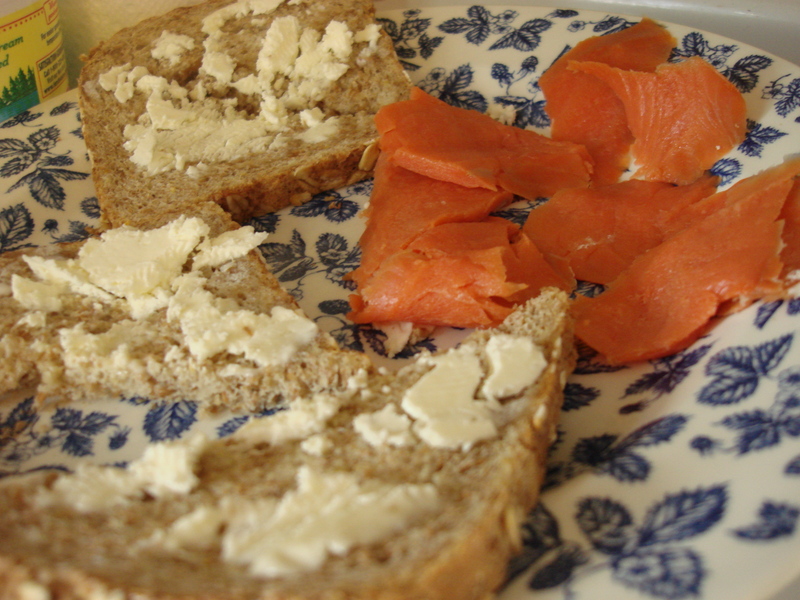 For example, Irish smoked salmon can be from anywhere as long as it is smoked in Ireland. Oh! that is interesting information indeed! You would be surprised that will all the fish we get here in Sicily, they don’t sell salmon! It’s my favorite fish but I only find it once in a while in the supermarket, not in the big fish market. I am following you from Trapani, Sicily. Buon giorno! Buon giorno, mille grazie per farme la visita…Non ho mai estata in Sicilia, pero ho vissuto due anni en Rovereto (TN)! Vorrei un giorno andara da te! Anytime. Let me know when you come. I am new to WordPress, just started a few days ago. I am actually Sicilian but I grew up in NY, that’s why I speak English. My husband retired so we moved back to my town here in Sicily. Trapani is getting well known now thanks to Ryan Airways having made it its base. So things are modernizing a bit. But my town is still the way it was when I left it in the 60s…although we now have internet:) Keep in touch! What an interesting story! I will follow you immediately so I can hear how it goes….it’s always fascinating to live in a place that is in a state of transition, however slow!